Washington, DC, June 12, 2012 - The Investment Company Institute Education Foundation (ICIEF) announced today that five Washington, DC high school students and three high schools earned financial awards as part of a new program designed to encourage local participation in a national financial education program. 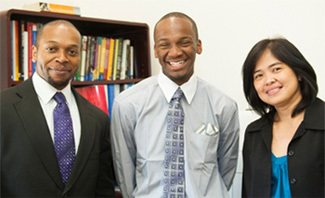 Markese Waugh of Theodore Roosevelt High School (center, with Principal Ivor Mitchell and teacher Marcelina Pascual) won a $1,000 award for high performance on the 2012 National Financial Capability Challenge. Roosevelt won a matching $1,000 award. Four students at Gonzaga College High School each won $1,000 awards for high performance (center left to right): William Bloom (perfect score), Peter Fafara (perfect score), Corey Ferrick, and John Butler. Gonzaga received matching awards for a total of $4,000, accepted by Rev. Vincent Conti, Headmaster (far left). Librarian Patricia Tobin (far right) and Una Daniels-Edwards from the Society for Financial Education and Professional Development helped prepare the students for the Challenge. 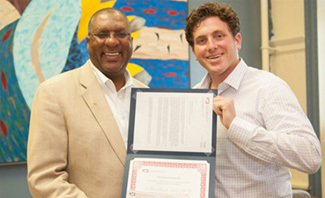 Duke Ellington School of the Arts Principal Rory Pullens (left), with teacher Seth Brecher, accepts an ICIEF award for high student participation rate in the 2012 National Financial Capability Challenge. The National Financial Capability Challenge is a joint initiative of the U.S. Departments of Treasury and Education. The online Challenge exam is designed to engage educators teaching personal finance and to increase the financial knowledge and capability of high-school aged students across the United States. More than 80,000 students and 2,500 educators in all 50 states, the District of Columbia, Guam, and Department of Defense schools overseas participated in the Spring 2012 Challenge. ICIEF awards $1,000 to the highest-scoring DC student and $1,000 to four other DC students with scores above 75 percent, selected randomly by Treasury. 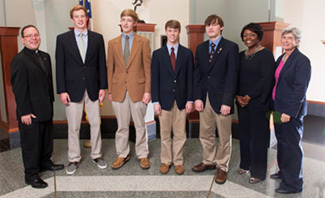 Each of their schools also receives a matching $1,000 award. We are delighted to see Challenge scores continuing to improve among District students," said ICI President and CEO Paul Schott Stevens. "This year, two students achieved perfect scores—the first time ever a perfect score has been recorded in the District of Columbia." ICIEF also awards $1,000 to each of the two DC high schools with the highest student participation rates. This year, The Duke Ellington School of the Arts and Theodore Roosevelt High School each received $1,000 awards for student participation rates.